I'm Barry Petersen and this Letter from Asia comes from Beijing. Going to the moon is old hat to America. We landed the first men in 1969. But China now has a real case of lunar fever, with motives that may go beyond exploring the final frontier. Just as China is emerging as an economic giant, it is also aggressively making its way into space. 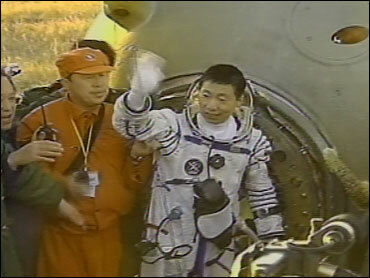 In 2003, its first astronaut - they call them taikonauts here - came home from fourteen orbits as a national hero. Right now, a Chinese lunar probe is sending home photos of the moon, anticipating the day in about 2018 when China will land its first taikonaut on the moon, two years before America's return to the lunar surface. Why spend billions on this? According to China expert Ken Lieberthal, "The Chinese recognize that space is a frontier that brings a lot of prestige. Commercially, they want to be able to launch satellites. They recently did for Nigeria, and Chinese built satellite on commission from Nigeria." The U.S. Military depends on space for communications, spy satellites, and GPS. The GPS is so accurate it can help soldiers on patrol know exactly where they are. China sees this. "They recognize very fully that space has an enormous military potential," says Lieberthal. "They recognize that in the U.S. military, space is absolutely essential for our current military strategy and capabilities." China's president recently promised that China would only be in space for peaceful reasons. Maybe... Or maybe not. China is restructuring its military along American lines - less manpower, more technological prowess. After China shot down one of its own derelict satellites with a guided missile, it's fair warning that China or the U.S. may someday put weapons into orbit. "I don't think either side has done the latter," says Lieberthal. "The big question to me is whether either side will pursue the latter. If they do, you can be sure the other side will be there to catch up very quickly." As Captain Kirk put it, it's the final frontier. The hope is that with two nations wary of each other and focused on space, space will remain a place for breakthroughs and bragging rights, not the battlefield of the 21st century.